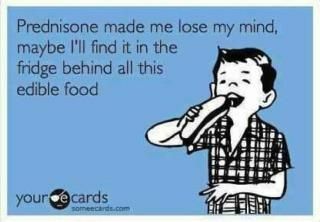 This video will make more sense if you read the full post, but anyone who has taken prednisone or any other steroid to stop a bad flare will understand. It made me laugh out loud. I might be delusional and over-medicated, but it’s pretty funny. You’d think I would expect it by now. 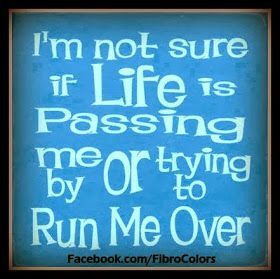 I’ve learned to manage and embrace the chaos of chronic illness, although it doesn’t make it any easier when its happening. Anytime I think I’ve finally gotten one step ahead, my illness is there to remind me that I am not in fact invincible, just merely invisible. The first time it happened over the weekend, I sat down to try to eat when my throat began to close up. I began to choke and for a second thought my husband was going to have to give me the Heimlich (which if you’ve ever met my husband, this is a very scary thought). Nothing I was eating contained any type of known allergy, so I thought it may be due to just general allergies or my swollen lymph nodes that had spread from my head into my neck. I took my Albuterol Inhaler, some liquid Diphenhydramine, and my daily Zyrtec and within fifteen to twenty minutes, the symptoms began to subside and I went about my day. Two days later, again while trying to eat something completely different and unrelated. Same thing happens. Again, I follow the same routine, but it’s in my head now. For the life of me I can’t put together a connection, other than the swollen lymph nodes. And it wasn’t caused by dysphagia, it was more of my throat closing in around my food, as opposed to the usual trouble of swallowing typically caused by the dysphagia itself. Again, I don’t really worry because it doesn’t last long and I figured this was just “another symptom” and my body proving how much it hates me. On Tuesday, the day after the second incident, I wake up feeling very weird. It’s my first day back to work after Memorial Day. I can’t pinpoint it, but it’s not the usual, “I feel terrible because of my illness, so bad in fact hat a normal person would call in sick, but this is just what my new normal feels like”. Oh, no, it couldn’t be that simple. It felt more like gravity had it out for me, in a “I need to hang on the wall the entire way of the hallway to make it to my work desk, because I swear the floor is trying to tell my face a secret”. I can’t see straight, my computer screen is blurry and I swear the room is moving (which being on the third floor, it may have been for all I know). I go to the health clinic on campus, just to get my vitals read and lay down for a moment. At this point I’m sweating. Why is it so hot here? It’s only like 40 degrees out… no one else seems to share in my pain. The nurse takes my heart rate which is about 120, surprise!, but my oxygen levels were stable at a solid 99, which on days like this they could be anywhere. She had me sit for ten minutes before taking my blood pressure, which she did on purpose as she says I was “too flushed” to take it when I first arrived. I would almost guarantee it would have been more interesting had she taken it when I first “stumbled” into the clinic, but oh well. She seems more concerned with the fact that my extremities are excessively cold and that I have a molted rash all the way up my arm. 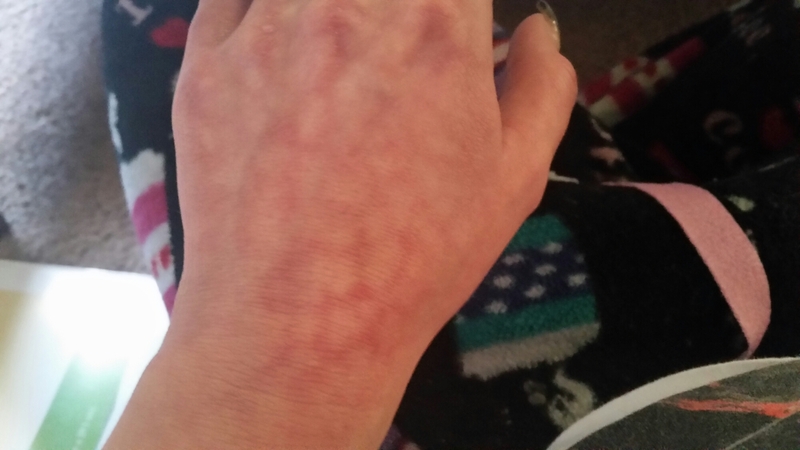 I tell her that in fact I feel like I about to spontaneously catch fire, as everything inside my body seems to be burning from the inside out, and that the molted rash is livedo reticularis. No I don’t know the cause, still trying to find a diagnosis. The nurse is just the sweetest woman, actually feeling concerned about the minimal amount of my symptoms that I can’t explain. She urges me to call my doctors, but I know they can’t offer any advice in this situation; and I am worried about missing work while being on “transitional duty” and accommodations. She asks if I want to rest then for a couple of hours… I accept 2o minutes. Maybe that will save my face from hitting the floor. Needless to say, 20 minutes later of laying in a closed, dark room on an ice pack did not make anything any sort of better. Again, she tried to tell me to go home, but I thought for sure I could handle this. I’ve struggled through way worse and it was only for a few more hours. I almost crawl back to my desk, once again grateful for the wall being my support. I sit once again at my computer, but can’t stop the world from spinning. My manager is gone, everyone in my area is off for a long holiday, and I can’t get a hold of anyone who knows the consequences of leaving work in my current predicament. I thought I was strong, but I could barely stay upright in my chair. I decide to go home, praying that I don’t get fired for missing yet another day. I go home and I sleep for 5 hours, wake up to do a little homework and then back to bed. I actually considered that maybe I had Mono, but remembered that I had it back in my early 20’s and it’s really not likely that I would be having a relapse over ten years later. Again, my body hates me, so maybe this is just a new normal. 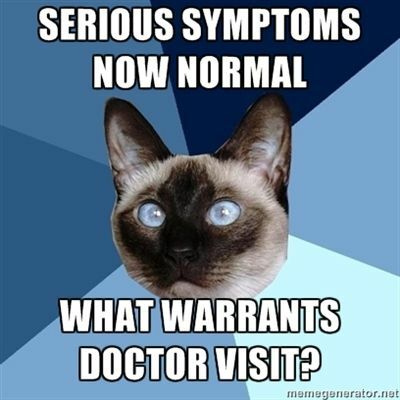 I seem “normal” on Wednesday and am able to make my follow-up appointment for my endometrial ablation recheck. They confirm everything is fine, although I am still having mild fluid that changes colors on the daily. They say it could last a few more weeks, so we shall see. 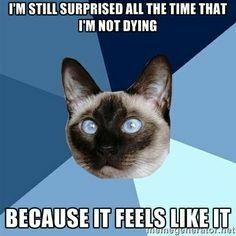 They’re also not sure why I had an episode of severe pain in my bladder shortly after the surgery that literally sent me to the ground in excruciating pain, it doesn’t sound related, but my body hates me so I’ll just accept it as that random symptom that happened one day, that may eventually come back years later. I come home from my doctor’s and go back to my midterms, finally starting to get ahead of schedule. I go to bed early to prepare myself for another day back at work. I wake up Wednesday morning, tired as usual but nothing seems out of the ordinary. I make my coffee and plant myself in front of the TV to watch the morning news. I feel a little wheezy, but with all the rain I justify it just being my allergies and take two hits off my inhaler. I try to drink my coffee, but I can’t even get a small sip to stay down. What the heck? I get more wheezy and hit my inhaler again, two more puffs. It’s not going in, I can’t breathe. I run (well, very slowly as I’m barely getting any air in), and try to swallow some Benadryl. Half goes in and half comes back out. Good enough. I sit down, I’m feeling faint at this point. It’s going to kick in soon, I know it is. I feel my chest getting tighter and tighter. I text my husband, who is working down stairs… “help”. He’s on a call for work, he’ll be up in a few. *Don’t panic”, I say to myself. This too shall pass. My heart is beating fast, I take a reading of 145, and my SpO2 is at 85… 84…83… I feel a rash coming across my nose and cheeks, it’s burning once again. I stumble to the bathroom mirror to see if I can see what’s going on with face. I can barely hang on to the sink, so I lower myself to the ground. At this point I can feel foam building up in my throat and then out of my mouth, I’m like a rabid dog. Oh dear god, how long is this phone call. Help me. Tears are flowing from my face, am I going to die? I can’t miss work again, no not again. My husband finally comes upstairs, not realizing the extent to which this has escalated. I was serious when I said I needed help. He immediately calls his boss to let her know what is going on and then sets up the albuterol nebulizer in hopes that it will help open my airway. My chest opens up from the asthma attack that was set off by my lack of airflow, but my throat is closing up even more. I can’t talk at this point and I’m still foaming in my throat and mouth. My husband thinks he should drive me to work so they can verify how sick I am but ultimately then drives me to the urgent care clinic (you’d think we’d go to the hospital, but the last time we tried a hospital when I had a pneumonia, and my oxygen levels had dropped below 80, they left me to die in the waiting room for over an hour, without even acknowledging me, and i told my husband to take me home to die. He forced me to go elsewhere although we had been turned away from so many clinics due to my levels being so dangerously low, which is how I found this urgent care clinic that we ended up going to.) going about 25 over the speed limit, which of course I’m hanging on for deal life, still trying not black out or throw up. We get there in record time and my husband drops me off in front while he parks. The lobby is FULL of people waiting, almost every seat taken, but the receptionist is actually one of the old receptionists that used to work at my current primary care’s office and know’s who I am right away and immediately runs to get help. They immediately take me to triage. The doctor is in fact the same doctor who was willing to treat my pneumonia, and in fact, remembers me as well. I can’t talk, but based on my history, they assume it’s asthma related and give me a duo-nebulizer treatment. Again, it helps my asthma but doesn’t even touch the swelling in my throat. 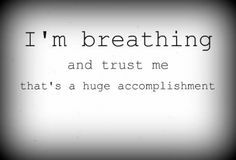 At this point I’ve had 6 puffs on my albuterol inhaler, an albuterol nebulizer, and duo-nebulizer, I feel like I am shaking so hard that I am going to knock over my chair. Luckily, my oxygen levels come up from the treatment, but they figure it has to an allergic reaction at this point. My heart is racing so high, they don’t want to risk epinephrine at this point. The give me a shot of solu-medrol, which is a steroid, as I have already taken allergy meds today as well and it does start to help shortly thereafter. When I can finally talk, she asks me about what happened and if I had any exposure to any known allergens. Nope, hadn’t eaten anything and couldn’t even drink my coffee. She points out the rash on my face, which clearly is typical of the “lupus butterfly rash”, as well as the livedo reticularis. But my ANA is ALWAYS normal… just like everything else. But clearly this is in fact NOT NORMAL. We thought maybe it was from all the radiation and contrast materials from all the medical testing I have gone through, but my last test was almost a week before and not likely the culprit. I mentioned the swollen lymph nodes, but since the time I got the injection, they had already gone down substantially on both my head and my neck, so no answers there. Again, my body hates me and I’m just a medical mystery as usual. But she believes me, she knows I am in fact NOT OK. I love her, I tell her I wish she could be my doctor. Unfortunately, she doesn’t work in primary practice, but did give me a name of a doctor to try with my insurance. 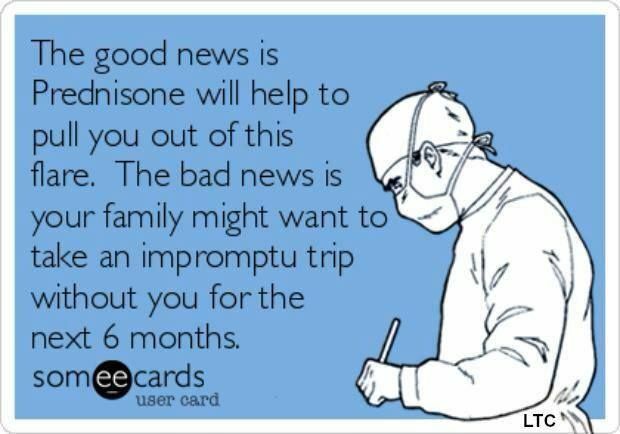 She discharges me once I am stable, with a prescription to start Prednisone (which always helps my flares) and an epi pen, which I haven’t had in years. Due to all the struggling, I unfortunately am left with lock-jaw and can barely open my mouth more than about a quarter of an inch. I’ve missed work again, but by the time we leave I have just enough time to make my afternoon therapy appointment, where I talked funny from the lack of movement in my jaw, and then followed that up with my dental appointment that had to be pushed out months.. And of course that was interesting, trying to get x-rays when you can’t physically open your mouth on your own, but the technician was so understanding and helpful, literally maneuvering it for me and was able to even do my cleaning. My dentist was amazing too, offering a specialized toothpaste to help my front teeth that are not quite bad enough to need fixing at this time, but have become extremely sensitive due to extreme enamel loss (which have literally discolored some of my teeth near the gum-line), more than likely due to my lack of nutrition and amount of acid breaking apart my teeth from being so sick. My friend jokes that I must enjoy torture, keeping all these appointments after the morning that I just had, but it was just business as usual. I finish up my night, wired and spinning from all the medication running through my tired body. 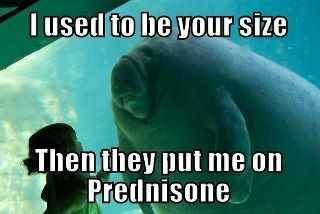 I have a love/hate relationship with Prednisone. 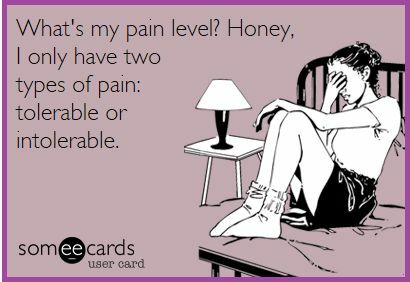 It stops the pain, I can eat, and I feel almost normal. But there’s the side effects and no doctor will prescribe it long-term because they can’t justify the risk at this point with my symptoms and no diagnosis. I can’t sleep as a result and my muscles keep spasming (most likely because of the injection), so I do my homework and prepare for midterms . I guess I do like to torture myself, in a way. My therapist keeps telling me I am strong, that no one person could keep going like I have been. She asks me where I find the strength to keep fighting. I tell her, once again, I really don’t have a choice. 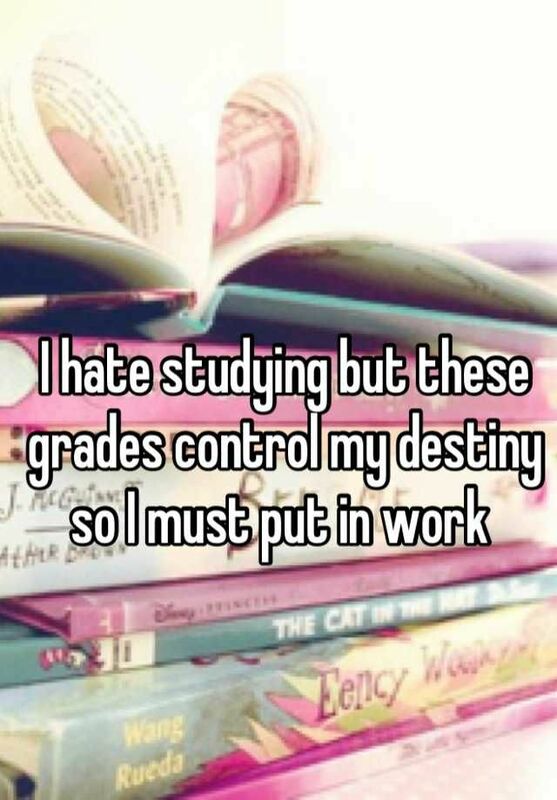 It has to get done. But I find my strength in telling my story through this blog. And in the lessons I learn from other’s who share their struggles with me. I am neither the strongest nor the weakest fighting this same battle. And I’m not going through it alone, not anymore. My strength comes from this community, inflicted with chronic and invisible illness. 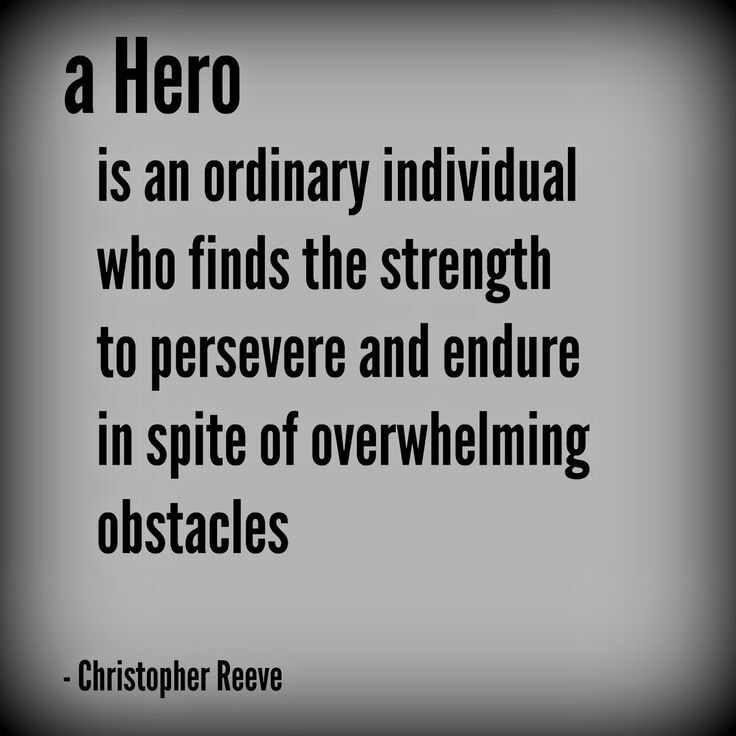 The true heroes who wake up everyday and keep going, despite everything, because they believe there’s a purpose to this life. It is for them that I can never stop trying.